What Color Does the Bride Wear for 3rd Wedding? Do the Groom's Parents or Bride's Parents Walk Down the Aisle First? 2 What Color Does the Bride Wear for 3rd Wedding? How to Plan a Traditional Wedding. There are so many different wedding themes available to today's couples, it's sometimes difficult to decide on the perfect one. 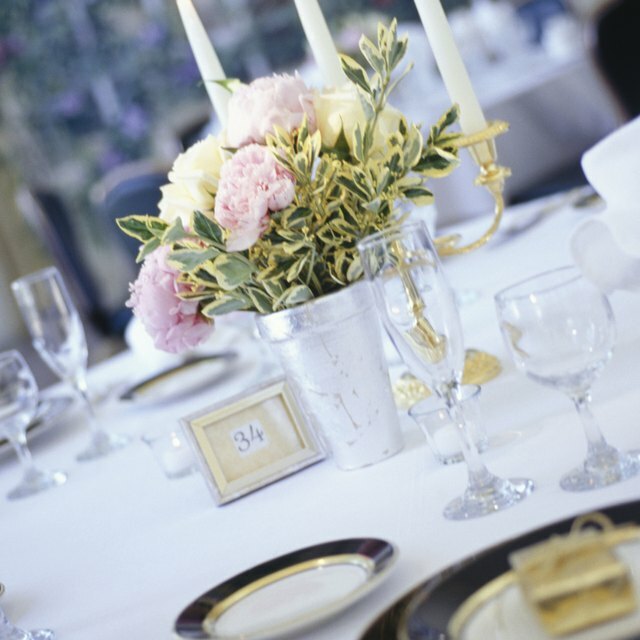 Simplify your choices by choosing a traditional wedding theme. A traditional wedding offers elegance and romance that will enchant any bride and groom with rituals and customs steeped in history. Select a beautiful white wedding dress. White has been the traditional wedding color since Queen Victoria married Prince Albert in the 19th century. Wear a formal train. A traditional formal wedding gown should have a train that is three to four feet long. If you are planning a Catholic ceremony, you may want a cathedral train, which can be up to 10 feet long. Dress the bridesmaids in formal gowns of the same style. The maid of honor may wear a different color than the bridesmaids. Rent tuxedos for the groom and his attendants. The groom should wear a white vest and tie, while the attendants should wear colors that match the maid of honor and bridesmaids. Plan to have one bridesmaid for every fifty guests invited to the wedding. For example, if you have 200 people invited, you will need four bridesmaids. The same rule applies to the number of ushers. Ask close relatives, such as a brother or sister, to be the best man and maid of honor. If you don't have a sibling, then a cousin should be the next choice. Include family members in the wedding party before friends. Invite two young relatives to act as the ring bearer and flower girl. Hold the wedding ceremony in a church or other house of worship. Most traditional wedding ceremonies are held in a church or synagogue. Say traditional wedding vows. There is no need to write your own if you stick with the basics. Include a lighting of the unity candle for Protestant ceremonies. Plan to have a full mass during the traditional wedding ceremony in a Catholic church. Begin the reception with a cocktail hour to entertain guests while the wedding party is having pictures taken. Stand in the receiving line outside of the dining room to greet guests as they sit down for dinner. Serve a traditional sit-down dinner. Listen to the best man toast the newlyweds. Watch the bride and groom dance their first dance as man and wife. The bride should dance with her father immediately follow the first dance. Cut the cake an hour or two before the reception ends and serve it with coffee or other beverages for younger guests.